The salary structure of the MLS seems to offer a perfect recipe for inequality. Team caps are low, but exceptions can be made for “designated players” whose salaries aren’t fully counted against the cap. As a result, there are players like Clint Dempsey: the Seattle forward makes about $5,000,000 while his team’s salary cap is less than $3,000,000. In fact, Dempsey rakes in almost 140 times the league minimum of $35,125. Across the MLS, the top 1% of earners take in close to a quarter of the total salary pool, but how does this compare to inequality in other professional leagues? One of the most common ways to measure income inequality on a national level is called the Gini coefficient. Using this method, incomes are sorted to determine how the total pie is distributed among the population. A coefficient of 1 represents total inequality, in which a single person has all the money, while a coefficient of 0 indicates perfect equality. 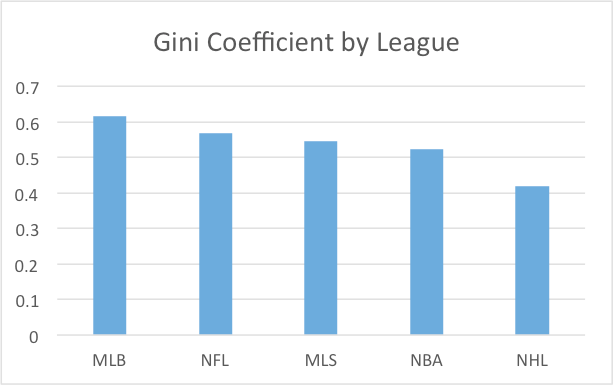 Using salary data from Spotrac, we can calculate the Gini for different sports leagues to determine salary disparities within leagues. As it turns out, the MLS is actually more equal than both the MLB and NFL. Despite the “Dempseys” of the league, the MLS has a coefficient of .544, which represents greater equality than the MLB’s and NFL’s marks of .615 and .567, respectively. How is this possible? The answer is that, while the very top MLS earners make exorbitant salaries, the rest of the league is fairly equal. The bottom 50% of MLS salaries constitute about 17% of total income, while the lower half of MLB earners make less than 8% of net salary. The designated players take a huge bite out of the MLS pie, but the remainder is divvied up fairly equally. The MLS is less equal, however, than the NBA and NHL, which weighed in at .524 and .418, respectively. Several policies could fuel the equality of these leagues. To begin with, both the NBA and NHL impose salary floors, meaning that teams must spend a certain percent of the cap on players each year. NBA teams are required to spend at least 90% of the cap, while MLB teams follow no such rule. Also driving the low coefficients could be limits on individual earnings. In the NHL, no single player can collect more than 20% of his team’s cap. In the NBA, the individual maximum is 35% of the team’s total– and even that is possible only for players with 10 or more years’ experience. But the MLB and NFL, which feature the most rampant inequality, don’t limit earnings in the same way. Lastly, there seems to be a relationship between roster size and inequality. Since an NFL team has to split money between 53 players and an NBA team only has to split between 13 players, one player taking in 20% of his team’s cap will lead to greater inequality for the football team. While baseball fans might not have a problem with a star player raking in significantly more than a middle-reliever, one study finds that salary disparities can hurt a team’s chances at winning. Still, Twins fans are probably willing to stomach Joe Mauer gobbling up more than 30% of team payroll to see their hometown hero behind the plate. What does the second graph look like, and the accompanying Gini coefficients, if you take the top 1% earners out for each league?